Carol M. Browner is President Barack Obama's "Global Warming Czar". Browner ran the Environmental Protection Agency under President Bill Clinton. Until she was tapped for the Obama administration, she was on the board of directors for the National Audubon Society, the League of Conservation Voters, the Center for American Progress and former Vice President Al Gore's Alliance for Climate Protection. She is married to her third husband, former Democratic Congressman Tom Downey. Browner grew up in South Florida, "where the Everglades were a bike ride away". Her parents, college professors at Miami-Dade Community College, gave the future EPA Administrator her first lessons in politics and an appreciation for the natural world. From 1986 to 1988, Browner worked in Washington for then-Senator Lawton Chiles, the late Governor of Florida. She also served as Legislative Director for then-Senator Al Gore. Browner graduated from the University of Florida in 1977 and then earned a degree from its law school. She served as General Counsel for the Florida House of Representatives Government Operations Committee in 1980. She then worked for Citizen Action, in Washington, D.C., which was founded by former Students for a Democratic Society radicals, Steve Max and Heather Booth, both later affiliated to Democratic Socialists of America. She he met her first husband, Michael Podhorzer, in Washington DC during this period. They married in 1987, but later divorced. From 1991 to 1993, Browner was Secretary of Florida's Department of Environmental Regulation, one of the nation's largest state environmental agencies. She won praise for dealing effectively with difficult issues involving wetland protection, hazardous waste disposal, and Everglades cleanup. In 2005 Carol Browner served on the board of Center for American Progress as the Principal of the The Albright Group. 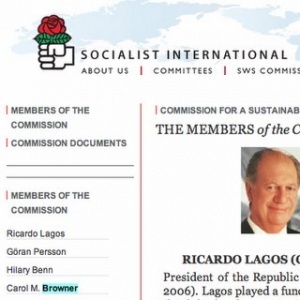 Until late 2008 Browner was a member of Socialist International Commission for a Sustainable World Society. The group's Commission for a Sustainable World Society, the organization's action arm on climate change, says the developed world must reduce consumption and commit to binding and punitive limits on greenhouse gas emissions. Mr. Obama, who has said action on climate change would be a priority in his administration, tapped Mrs. Browner last month to fill a new position as White House coordinator of climate and energy policies. The appointment does not need Senate confirmation. Mr. Obama's transition team said Mrs. Browner's membership in the organization is not a problem and that it brings experience in U.S. policymaking to her new role. "The Commission for a Sustainable World Society includes world leaders from a variety of political parties, including British Prime Minister Gordon Brown, who succeeded Tony Blair, in serving as vice president of the convening organization," Obama transition spokesman Nick Shapiro said. 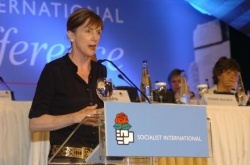 "Carol Browner was chosen to help the president-elect coordinate energy and climate policy because she understands that our efforts to create jobs, achieve energy security and combat climate change demand integration among different agencies; cooperation between federal, state and local governments; and partnership with the private sector,"
Other U.S. delegates to the SI 13th Congress, Athens, Greece June 30th 2008 included a delegation from Democratic Socialists of America; Frank Llewellyn, Corey Walker, George Roberts, David Duhalde and Alejandro Duhalde plus another DSA member Andrew Hammer attending with the International League of Religious Socialists anf former New American Movement radical Jeremy Rifkin representing the Foundation on Economic Trends. Other delegations came from several Marxist	parties including the Socialist Party of Albania, Bulgarian Socialist Party, Frelimo (Mozambigue), Hungarian Socialist Party, the Mongolian Peoples Revolutionary Party, Democratic Left Alliance (Poland), Movement for Socialism (Venezuela) and guests from the Brazilian Workers Party and the Communist Party of China. Though living in Maryland, Carol Browner also donated to the 2006 Senate campaign of long time Vermont Congressman and open socialist Bernie Sanders. CAROL M BROWNER (THE ALBRIGHT GROUP/ATTORNEY), (Zip code: 20912) $500 to SANDERS FOR SENATE on 05/25/06. 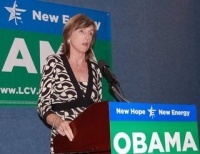 In 2008, Carol Browner endorsed Barack Obama through her leadership position in the League of Conservation Voters. Sen. Sheldon Whitehouse spoke at the Center for Democracy in the Americas' 8th Anniversary Event, June 19, 2014. He gave an award to Carol Browner. Bernie Sanders supporters Dr. Cornel West and Rep. Keith Ellison (D-Minn.) will be among those on the Democratic Party's important Platform Drafting Committee after the Vermont senator won a key concession as he looks to leave his mark on the party's platform. The roster of the drafting committee, released by the Democratic National Committee May 2016, reflects the party's agreement that Sanders would have five supporters on the committee, compared to six for Hillary Clinton. Sanders previously panned DNC Chairwoman Debbie Wasserman Schultz, who appoints all of the committee members, for failing to include enough of his supporters on an initial list. But the latest statement notes that Wasserman Schultz allocated the campaign's seats "proportionally according to the current vote tally." Sanders supporters on the committee are author Bill McKibben, Arab American Institute head James Zogby and Native American activist Deborah Parker. Clinton loyalists on the committee are Ambassador Wendy Sherman, former Clinton staffer and current Center for American Progress head Neera Tanden, Ohio Rep. Alicia Reece, environmentalist Carol Browner, Illinois Rep. Luis Gutierrez and union head Paul Booth. The remaining four members were chosen by Wasserman Schultz. Maryland Rep. Elijah Cummings, who has endorsed Clinton, will lead the committee and called Sanders's outsized role on the platform "pretty unusual" for a candidate that likely will not be the party's nominee during a Monday interview on MSNBC. And California Rep. Barbara Lee, who has not endorsed either candidate. Former Rep. Howard Berman and philanthropist and former CEO of Claire's Stores Bonnie Schaefer were also appointed. This page was last modified on 20 June 2016, at 14:53.